Also, it only takes around an hour to prepare! 1. To clean squid, first firmly grasp the head of the squid and pull it out of the body along with the cuttlebone. Immerse squid in a bowl of water to remove the skin on the outside by simply peeling it off. Cut the tentacles off just before the eyes and reserve. Remove and discard the beak, the eyes and the cuttlebone. 2. The ink sac is located in the middle of the entrails, gently remove the ink sac and set aside – be careful not to puncture. Score only the top side of each squid body halfway thru. 3. To make the spice paste, toss rehydrated chilies, red chilies, shallots, garlic, turmeric, ginger, lemongrass and belacan into a mixer grinder to blend at medium setting, until smooth. 4. In a bowl, combine 2 tbs of the spice paste, salt and oil with the squids, then leave to marinate for 15 minutes. 5. Cook squid in steamer oven at steam setting for 7 minutes. When cooked, remove and reserve the liquid from the squid. 6. Heat up oil in a pan for frying the rest of the spice paste. Toss in the kaffir lime leaves and lemongrass, mixing the ingredients well. 7. Next to the pan, add in the squid ink sacs, tamarind water and sugar. Use your spatula to break up the ink sacs while frying the ingredients. 8. Pour in the squid juices and bring up the heat to a simmer. 9. When thickened and adjust the seasoning with sugar and pepper. 10. To serve, lay the bean thread noodles first on your serving plate. 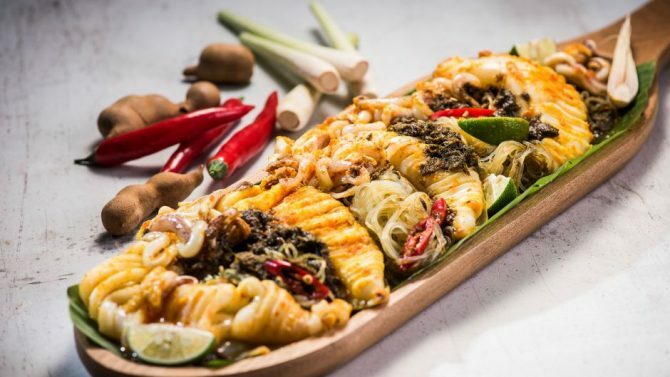 Then spoon a generous amount of squid ink sambal over the noodles, followed by placing the steamed squids on top of the noodles. Spoon more sambal in between the squids, garnish with red chilies and lime wedges. This recipe is provided by Asian Food Channel. For more recipes like this, visit their newly revamped website.